The Explore Scientific ED127CF Triplet APO is the first refractor telescope I have ever owned. With a native focal length of 952mm and 127mm (5 inches) of aperture (F/7.5), it lives somewhere between the “wide field” 80mm refractors and the longer SCTs used for planetary imaging, both in terms of field of view and imaging “speed”. When coupled with Explore Scientific’s 0.7x Reducer/Corrector, the ED127CF widens to an equivalent focal length of 666mm and faster focal ratio of F/5.25. Here are some star quality tests shot with this scope/reducer combo. The following 100%-crop mosaics were made using a Canon 6D and a Canon 60Da to show the differences in corner/edge performance between Full-Frame and APS-C sensor sizes. No filters were used as the 0.7x Reducer/Corrector does not provide any means of attaching filters (although some have made modifications to do so). Figure 1: Single exposure taken with a Canon EOS 6D (unmodified), 180 seconds, ISO400. 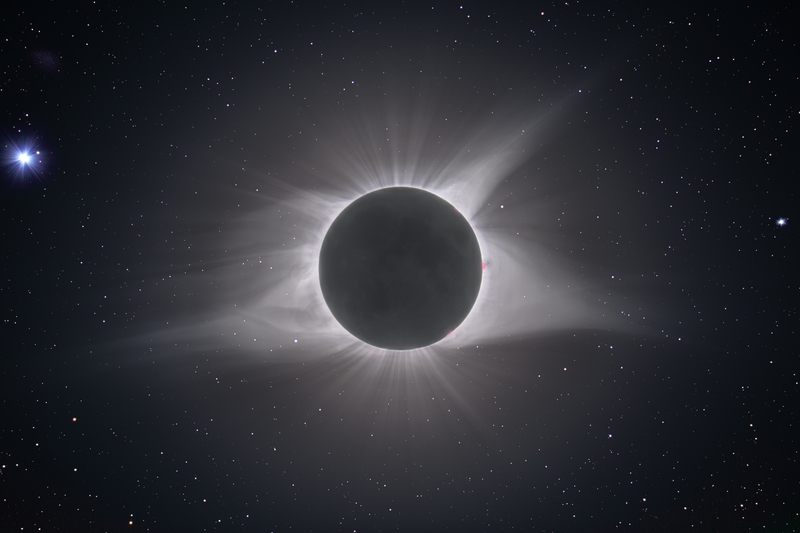 Several dozen exposures, including this one, were stacked to create the star field background in the 2017 Total Solar Eclipse photo in Figure 5 below. The eclipse itself was also shot on the same ES ED127CF + 0.7x Reducer/Corrector with the same EOS 6D body. Figure 2: Single 4-minute exposure taken with a Canon EOS 60Da, 240 seconds, ISO800. 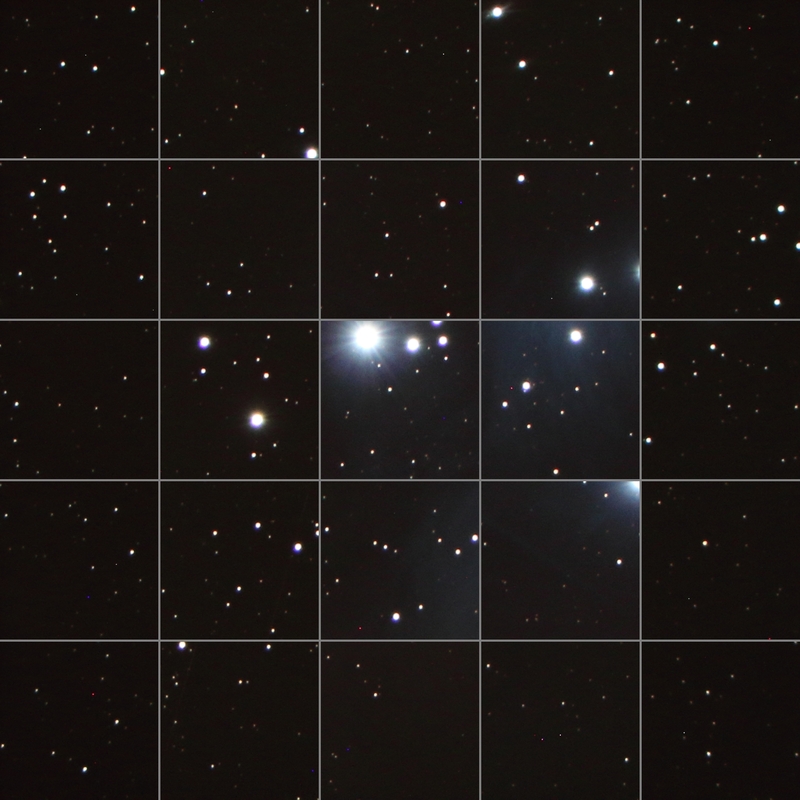 Several dozen 4-minute exposures, including this one, were stacked to create the image of the Pleiades in Figure 6 below. In both of these images, some color fringing is present in high-contrast areas, but the amount of Chromatic Aberration present is nothing that can’t be dealt with in post (see sample images below to see how it can still be removed after heavy processing). 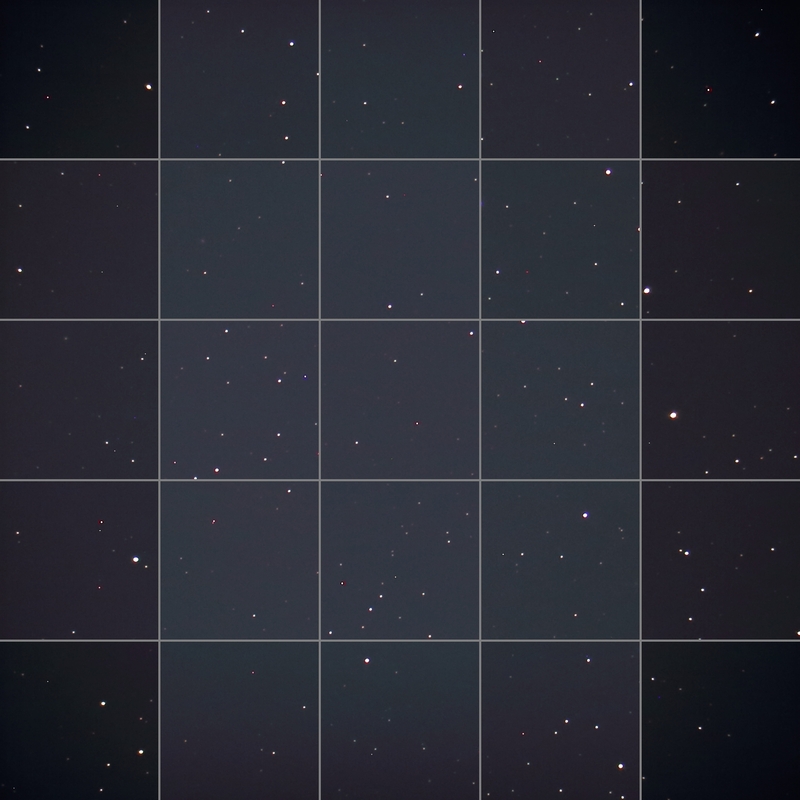 What’s great about both of these mosaics is that there is very little elongation of stars at the corners, both for APS-C and Full Frame sensors. 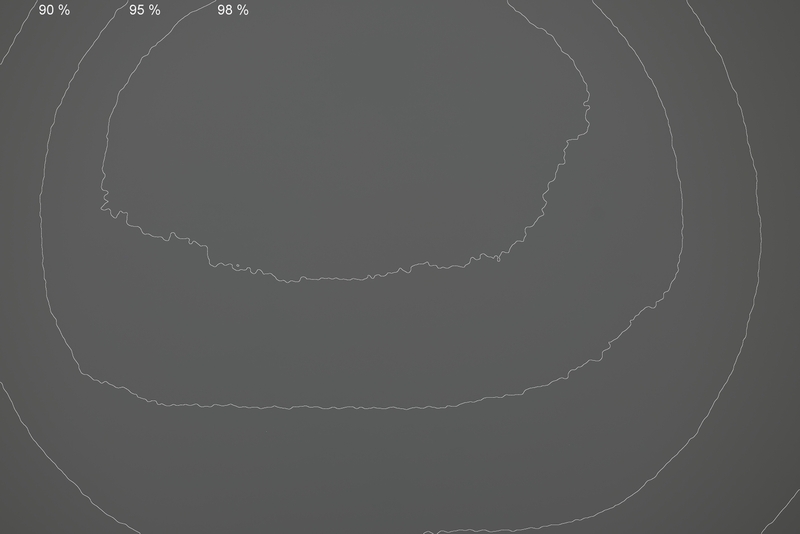 Coma and astigmatism are both very well-controlled, all the way to the edges. Below are two contoured images created from flats produced with both the Canon EOS 6D and EOS 60Da. This is where the similarities in performance for both sensor sizes end. Figure 3: Vignetting profile for the Canon EOS 6D. 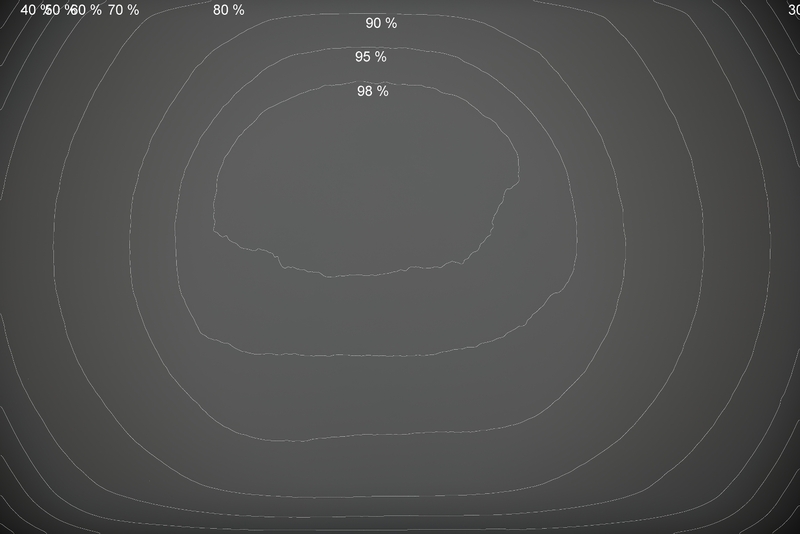 Figure 4: Vignetting profile for the Canon EOS 60Da. As you can see, the vignetting on the EOS 6D is severe with less than 30% of the light coming in at the center reaching the corners. This can result in unwanted processing artifacts appearing in the corners of your images as soon as you calibrate your subs. On the other hand, vignetting on the EOS 60Da is almost non-existent with nearly 90% of the light present in the center still reaching the corners. The Explore Scientific ED127CF is a great piece of hardware for the money, yielding fantastic images given the right sensor size. While it’s unfortunate that the vignetting ends up being so severe for the extreme corners of full-frame sensors, APS-C sensors fare much better. Even so, great images can still be made with full-frame sensors, given the right observing conditions. One of my favorite full-frame images captured with this setup is my shot of the 2017 Solar Eclipse, shown below. Barring another Solar Eclipse outing, however, I think I’ll stick to APS-C sensors on this particular combo. Figure 5: 2017 Total Solar Eclipse, taken near Douglas, WY, with a Canon EOS 6D. Prints available. 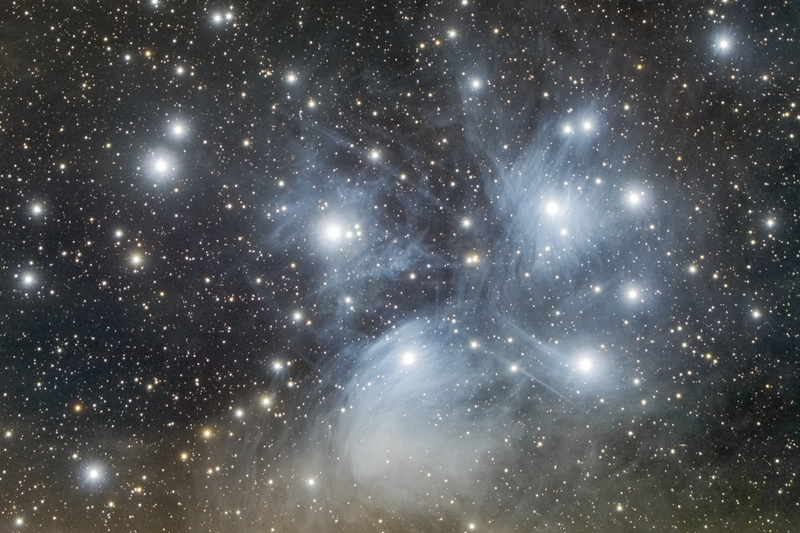 Figure 6: The Pleiades, captured with a Canon EOS 60Da. Prints available. Exciting for you my friend! Fun to see the passion you have for this! Praying you have a wonderful and blessed Christmas!